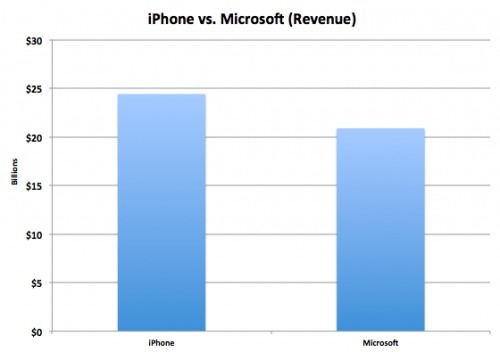 Apple's iPhone business alone is now bigger than all of Microsoft put together, notes MG Siegler and Business Insider. In the December quarter, Apple's iPhone business generated $24.4 billion of revenue. Microsoft's whole company, meanwhile, from Windows to Office to servers to XBox, generated $20.9 billion. That's a pretty impressive observation. Applying Apple's average overall profit margin of 38%, the company generated about $9.3 billion for its iPhone business alone. Microsoft generated only $8.2 billion in profit.